In 1975, Hetty Friedman first traveled to the Highlands of Guatemala to learn back strap weaving from a Mayan weaver. After that time, Guatemala entered a period of intense political unrest. Thirty two years later, Hetty was able to return. In partnership with Asociación Maya de Descarroll , a Fair Trade Weaver’s Coop, she is designing unique woven products, training weavers and leading tours. Together they produce a line of hand dyed, hand woven items that are being marketed in the USA. Adventurous travelers are provided with a unique exploration of the Guatemala Highland pueblos, Antigua, a Unesco World Heritage City, and visits to various artists and fair trade jewelry and weaving co-ops. Join Hetty on an intimate tour of Guatemala’s fabulous cultural heritage. Lots of guacamole gets eaten. Small, intimate group travel for women. Meet Mayan artisans, visit Antigua, a Unesco Heritage site, and travel on Lake Atitlan. Great food, wonderful hotels and good company. Call 617-512-5344 or email hetty.friedman@gmail.com for details. Register for 2015 travel NOW! In Guatemala, Hetty works with the Asociación Maya de Desarrollo designing and developing new product, consulting with the master dyers and styling color lines. The collaboration between designer and weavers results in new styles that are vibrant, wearable and marketable. The sales of these items enable the weavers to continue with their traditional work, stay in their villages and provide education and health care for their children. Hetty travels to Guatemala to work with the Asociación Maya de Desarrollo a Fair Trade Weaver’s Cooperative in Sololá, Guatemala. 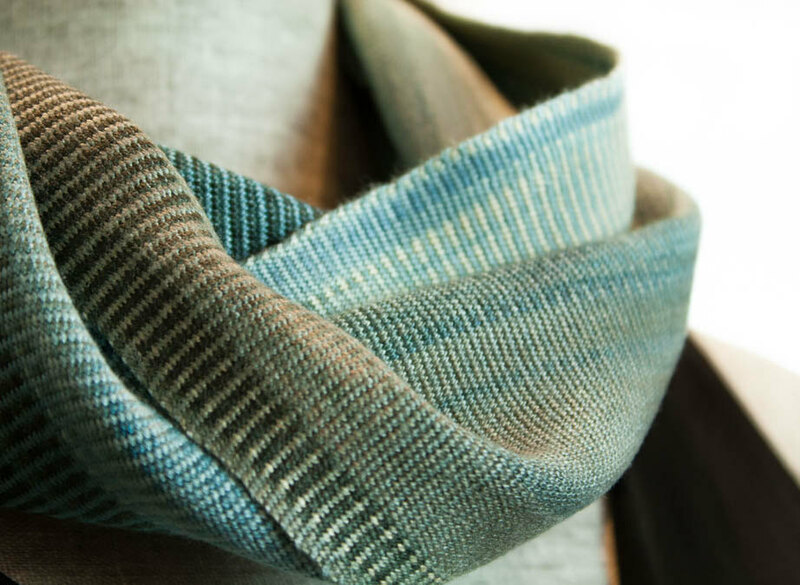 Her teaching includes technical workshops for the weavers and dyers and new product development. The weaving workshops include reading and creating weaving drafts. The goal is to expand the weaver’s repertoire and enable them to increase their sales and business expertise. Are you a summer foodie? 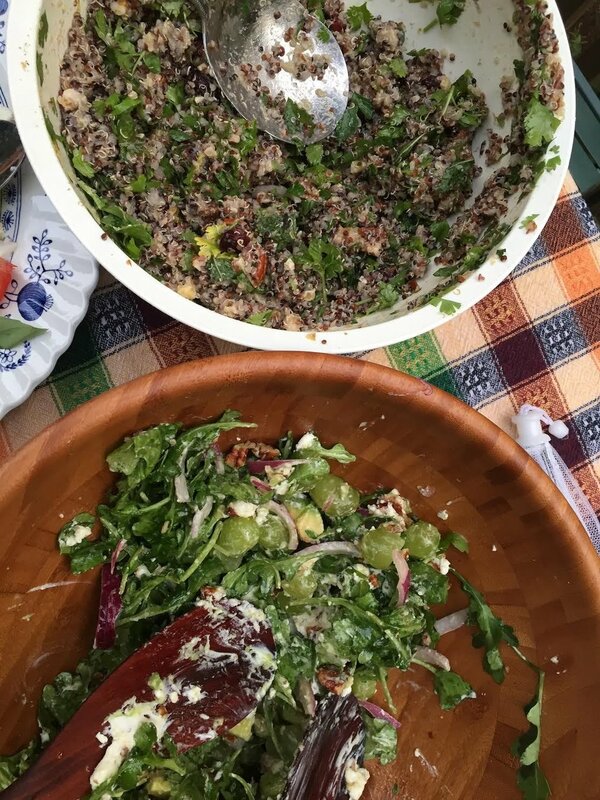 I've had more backyard dinner parties than I can count on one hand this year - I love sharing fresh summer ingredients with family and friends. 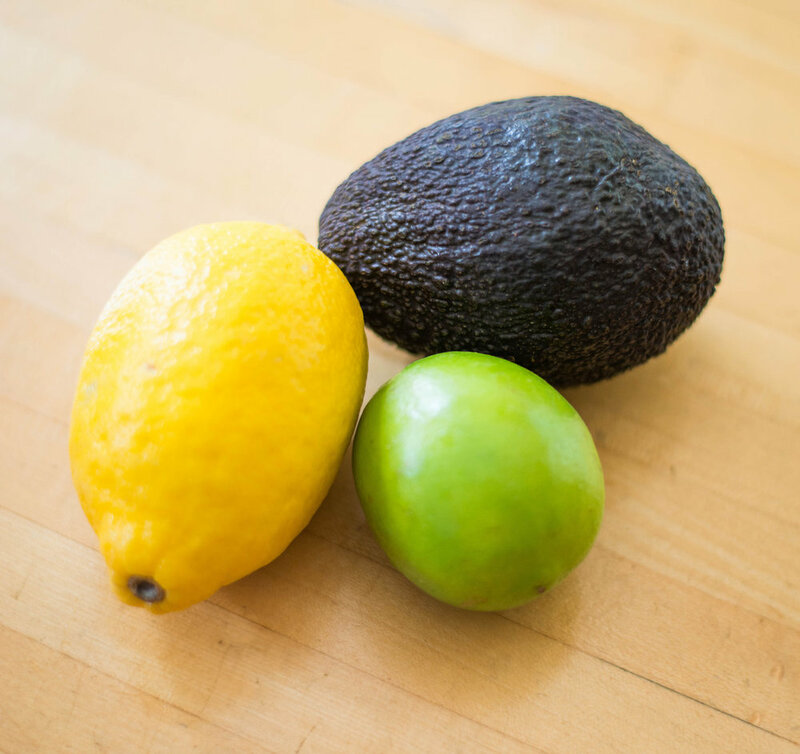 Here are two new recipes that I tried this summer! Let me know how you like them. Whisk all vinaigrette ingredients together for 30 seconds until combined. Add salad ingredients to a bowl, and drizzle with vinaigrette. Toss to combine. Serve immediately. 1 - Bring water to a boil in a 3-quart saucepan and add quinoa and salt to taste. 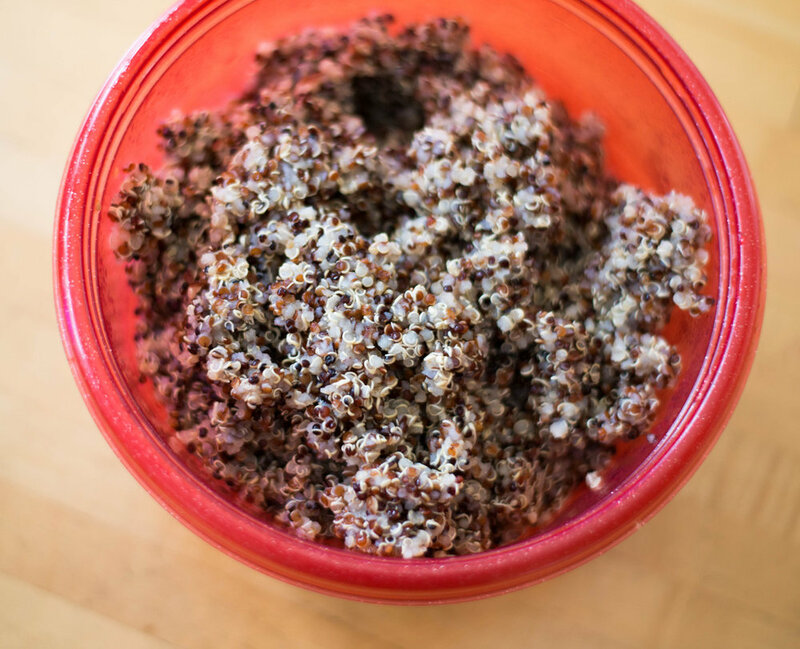 Bring back to a rolling boil, then reduce heat slightly and boil gently for 20 minutes, or until you see a thread emerge from the blond and red quinoa. Drain and shake well in the strainer, then return to pot. Cover pot with a dishtowel and then a lid and let sit for 10 to 15 minutes undisturbed. Transfer for a large bowl. 2 - Meanwhile, whisk together lemon juice, salt, garlic, cinnamon, and pomegranate molasses. Whisk in olive oil. 3 - Toss together quinoa and dressing. Add remaining ingredients and toss together. Transfer to a platter, a wide bowl, or individual plates to serve. Share them on my Facebook page! A weekend trip to Williamstown MA for a wedding led us to Mass Moca. I hadn't been there in a while and was wowed by what they've done - the museum is much larger and so inspiring! 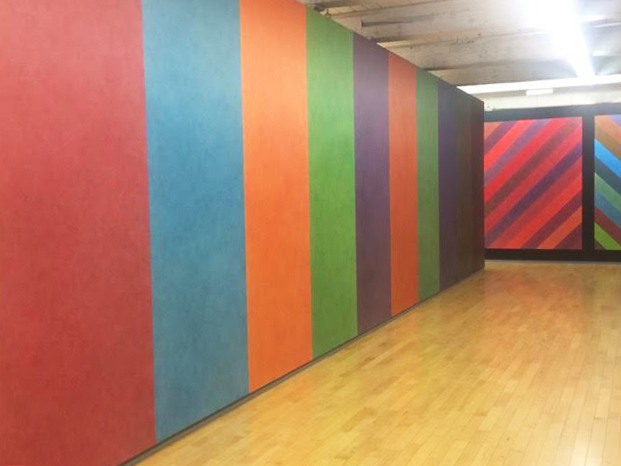 I especially loved the Sol LeWitt retrospective, which had 105 of his wall drawings on display. He has always been a huge color inspiration for me, and it was refreshing to see these paintings in person. Do you notice any similarities? We spent a few hours meandering through the old warehouse space and then headed next door to the brew pub to try out a flight of beers. Great on a warm summer's afternoon. We stayed at the Journey's End BnB. Amazing breakfast and wonderful company. Have you gone on any interesting journeys this summer? Tell me about it on Facebook! I've also posted more vintage earrings in my Etsy shop! Do you miss Summer Camp too? I went to sleep-away camp at Camp Taconic for two months when I turned 10 and never looked back. I made great friends, took field trips, laughed a lot and learned to play tetherball (and curse). I also went to camp at Buck's Rock in Connecticut, where I learned to weave 50 years ago. We did weaving, batik, dancing, jewelry making, woodworking, and more. 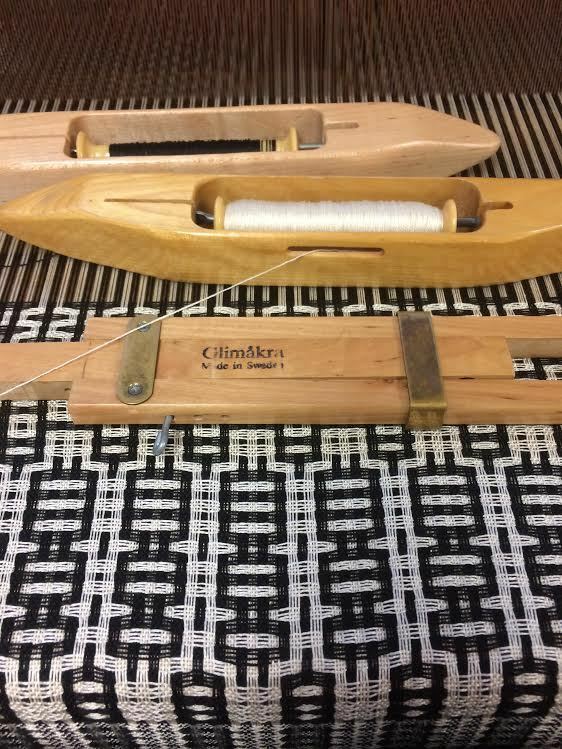 I went back to visit recently and saw the weaving studio, 50 years later. Did you go to Summer camp? Do you still find ways to go to camp now? When I travel to Guatemala with groups of women every year, I feel like I'm at camp again. Find some more striped Summer scarves and vintage earrings in my Etsy shop this week! I'd been flirting with going to The Weavers' School in Coupeville, WA for a number of years. 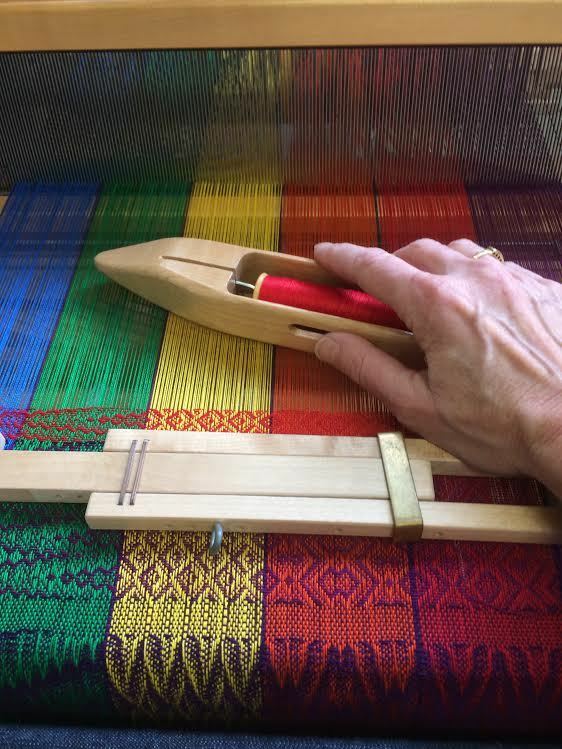 This April, I was afforded the opportunity to do the Weaving II Course. Me sitting at one of the 8-harness, Baby Wolf Schacht looms. Why should I do it? I’ve been wanting to experiment with 8 harness weaves and wasn't taking the time out of production weaving to do it. 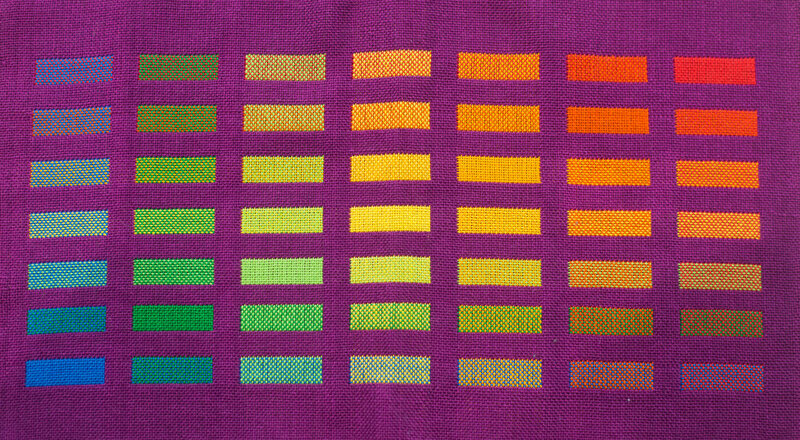 Color gamp in 8 harness twills. Deflected double weave. Wait till you see it washed. It truly exceeded my expectations. Madelyn van der Hoogt is a superb teacher. She is incredibly organized, has the best sense of humor, and inspired all of us to do incredible work that week. My time on Whidby Island included shopping, exploring, ferry rides from the mainland, a night in Seattle and making new friends. Top it off with mussels, martinis and a supportive, fun group of fellow weavers - I was a happy camper. View one afternoon from my window at the Anchorage Inn. The looms were threaded for us so it was like having a loom angel. My woven samples. What to do next? What experiences have you had lately that surprised or amazed you? Tell me about them on Facebook! Deflected double weave. What I went there to learn! From my Guatemalan earring collection. I have been working on learning Spanish for the past 7 years now. I wish that I was fluent and I’m most definitely not — I’m very conversational. People understand me (mostly). I’m always working to improve my grammar. I have been working on my “attitude" and taking a more "can do" approach by asking around for methods. I'm using many modalities (like speaking, reading, listening), and just sticking with it. Every week, I Skype for one hour with Jabel Tinamit, an online Spanish school located in Panajachel, Guatemala. It helps that I am in Guatemala twice a year as well, and I always do my homework! I have also taken up Salsa Dancing with my dancing partner (here's to you WH). That's coming more easily but still can be challenging. Are you trying to learn new things? Let us know about them on Facebook. Check out the new loop colors in my Etsy shop. 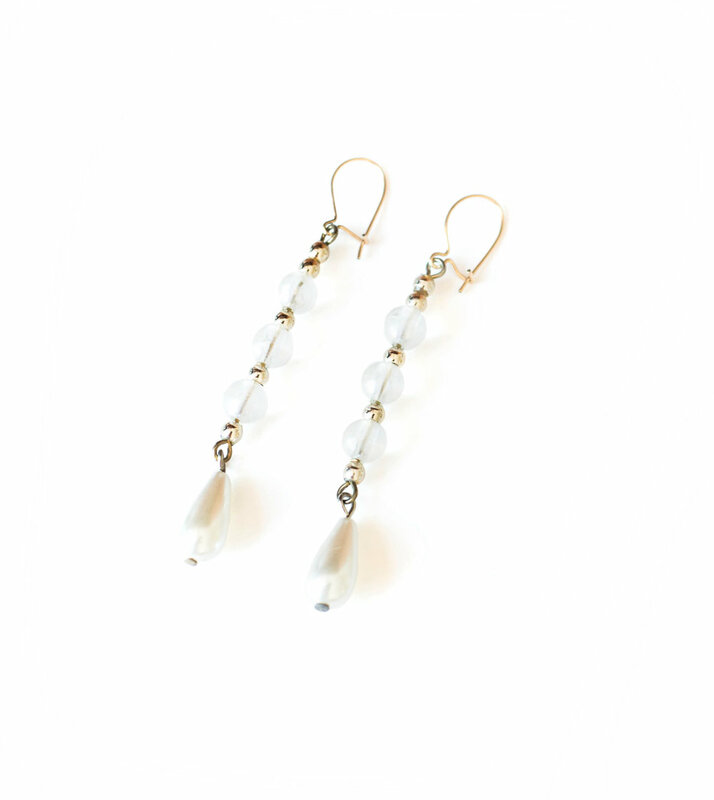 They are a perfect accompaniment to your summer sun dress, linen top or favorite T-shirt. Keep you warm on the sail boat, and colorful at the BBQ. Summer Mobius Special + Staycation Tips! Doing some Staycationing this summer? Me too! These are some of my favorite day trips - yes, everything includes food. See below for a special summertime gift from me to you! 1 - Drive to Westport, MA and head to Horseneck Beach for some beach walking, book reading, and napping. The go up Main Road to the Dee Shatuck Gallery for some culture, and the Westport Winery to pick up some wonderful local wines and get a tour. End your day with dinner at The Bayside for sunset. Their farm is the home of the fourth generation of a family of winegrowers. 2 - Or head North to Essex MA and take a gorgeous Essex River Cruise, then head over to JT Farnhams for fried clams and lobster rolls. 3 - Explore the outdoor spaces in local museums! The Decordova Museum has a fabulous sculpture garden, cafe, and it's on a lake. Check out the excellent museum shop while you're there. The ICA is right on the Harborwalk. 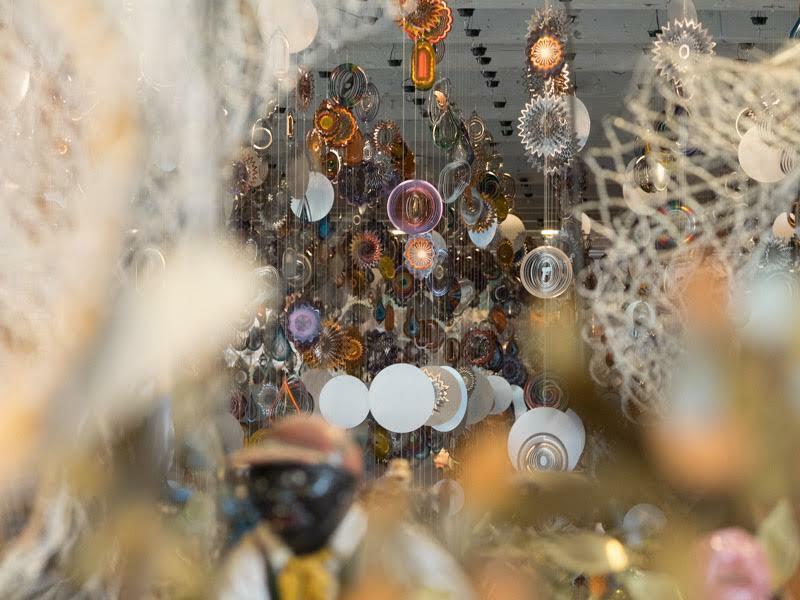 Check out the latest exhibit then walk along the waterfront to the Harbor Boats. No matter how much time you have, there's a cruise for you. Bring a picnic dinner and have a meal during sunset. We loved visiting Little Brewster Island. There's even a lighthouse keeper still living there. She'd love to see you! Climb the ladders and 76 steps up Boston Light’s tower! What do you recommend in your area for fun summer stuff? ENJOY! And take your mobius along to keep you comfortable on those breezy nights. These mobius shawls (are more!) are available in all new colors are available in my Etsy shop. I love the mobius for Summer because they're lightweight, versatile, and perfect for travel. They're 15% off with the coupon code SUMMER17 until June 9th! Shop my Etsy store here. My pre-Mother's Day trip. Find yourself (or someone else) a gift at the Clever Hand this weekend! Clever Hand Gallery is hosting a Hetty Friedman Designs Trunk Show this weekend! I am going to be there to "meet and greet" and get you that perfect color. I will be bringing new Spring/Summer pieces and some surprises to offer. Come and find many other beautiful, hand-crafted work by local New England artisans, to celebrate yourself or the mother in your life. Enjoy a walk around Wellesley and lunch afterwards. I had a great Pre-Mother’s Day week with my kids in April. 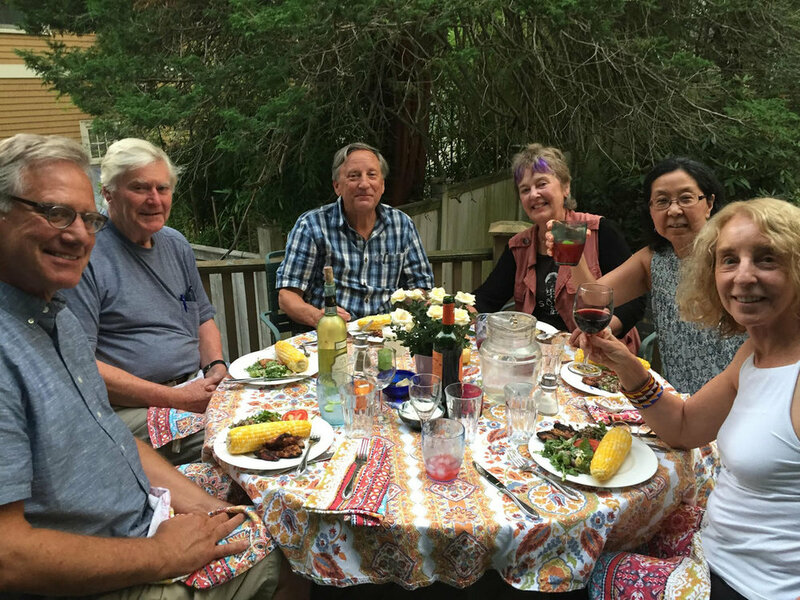 After taking a week long class at the Weaver’s School in Coupeville, WA, I made my way to SF, Pescadero and Oakland for a wonderful week of family and friend time. Dinner at ALTA before the show in SF. Yummy yummy yummy. Michaela gifted me, Alex and her BFF Caitlin (my "2nd daughter") to tickets to Hamilton in SF. It exceeded my expectations. 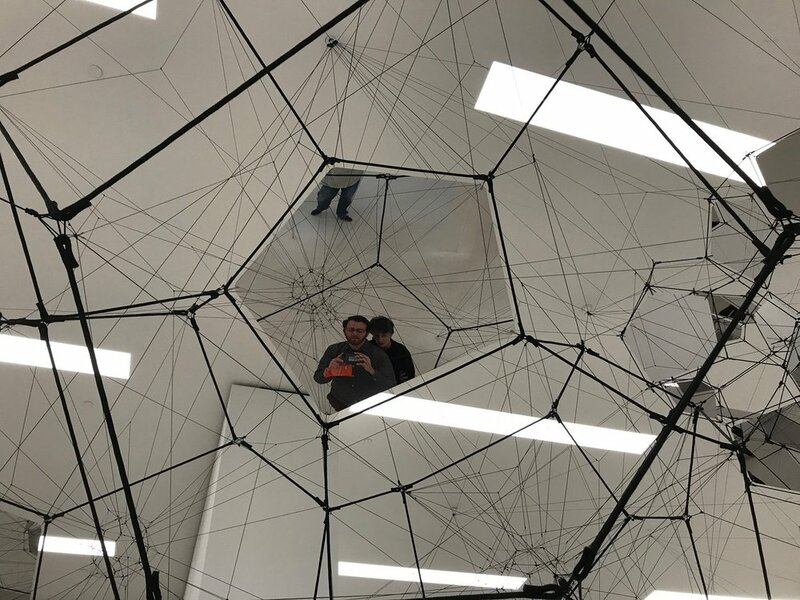 Alex and I went to the San Francisco Museum of Modern Art and saw the Cloud Cities exhibition by Tomás Saraceno, along with bright and graphic paintings! How are you going to treat yourself for Mother’s Day this year? An opportunity to contribute and win a mobius shawl. Lyndhurst this weekend !! I had a great weekend at Spring Crafts at Lyndhurst! The Brooklyn Youth Chorus is hosting an online auction as a part of their 25th anniversary gala. My amazing niece Aliyah Weiss is a proud member of this chorus. They perform around the world. I am happy to support their efforts. If you want a great deal on a hand woven, organic bamboo mobius shawl, you can bid on it right here. Watch their Silent Voices video here. My Spring Cleaning can be your next bargain! It’s time for Spring Cleaning! My first order of business was to sort through my hats, gloves, and neckwarmers. ...which was a success! But I did end up with three lonely black gloves. Does anyone have their match? I also repainted and reorganized my show room (AKA front living room). 25 year old paint became lighter and brighter. Now there's a bit more room to weave, try on pieces and take in all the color. These designs are leftover from years past and they're looking for a home. 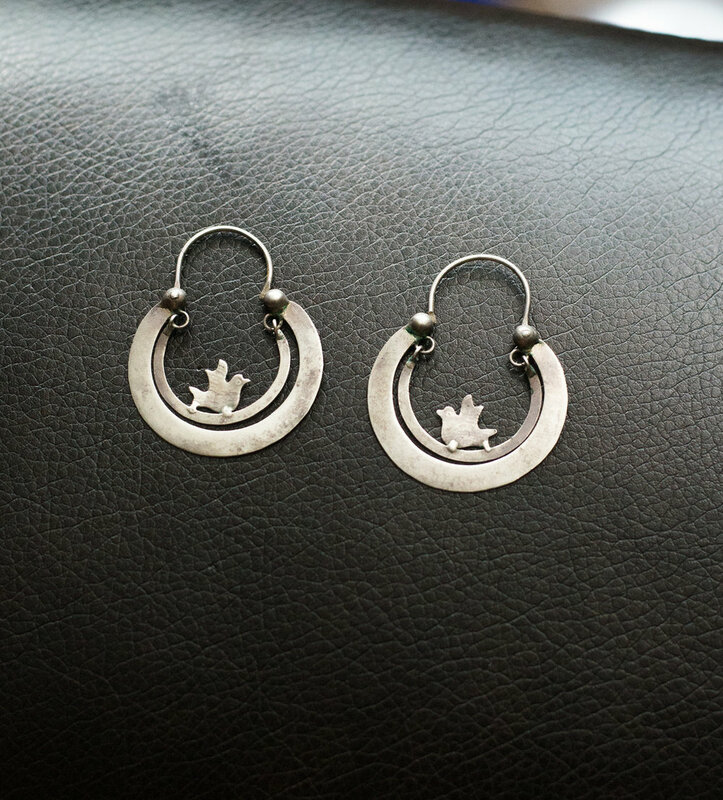 They're only $45 on my Etsy shop, it’s like an online garage sale! Lots to see - check them out here! Southeastern Massachusetts University at Dartmouth: 1975. My first real studio space. MFA time of life. I’ve always been fascinated with color, but sometimes it’s fun to see all the possibilities that black and white has to offer - to wear, to design, and to collect. I love these handmade black and white pieces by my friend Linda Freeman! And of course...black pants and shoes. This is about a third of my collection. Anybody else have the same problem? I also gather inspiration for new pieces with my pattern books and black and white yarns. They have their own shelf, and I always make sure to create new neutral designs along with my more colorful pieces every year. 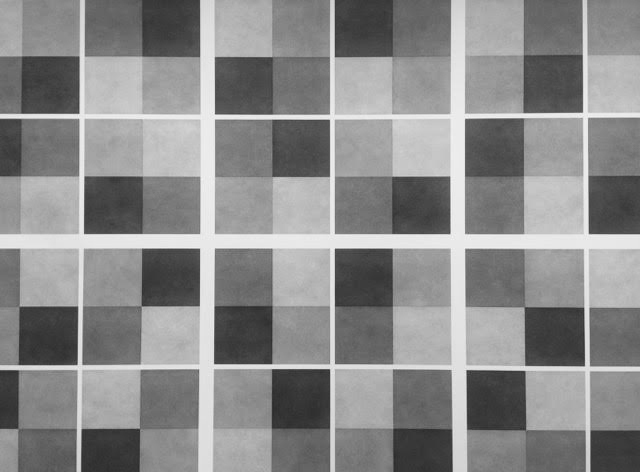 For the rest of the month, all the black and white pieces in my Etsy shop are 15% off with the coupon code BW15APRIL! Looking for a great activity this weekend? Come to Newton Open Studios! Newton Open Studios is this weekend! My first 'home' show of the season. Such fun to walk around the 'hood, stop in for a cuppa something, see different venues, support the arts, and get some good walking in. At 72 Columbus Street find weaving, jewelry, pottery, cards, glass, quilts and friendly faces!!! I’m offering 10% at this event to everyone who forwards this email to someone who isn't on my mailing list! Mention it to me when you come to the show. My booth at Paradise City for those who couldn't make it. Want a little bit of Paradise this weekend? + get your discount coupon for entry! 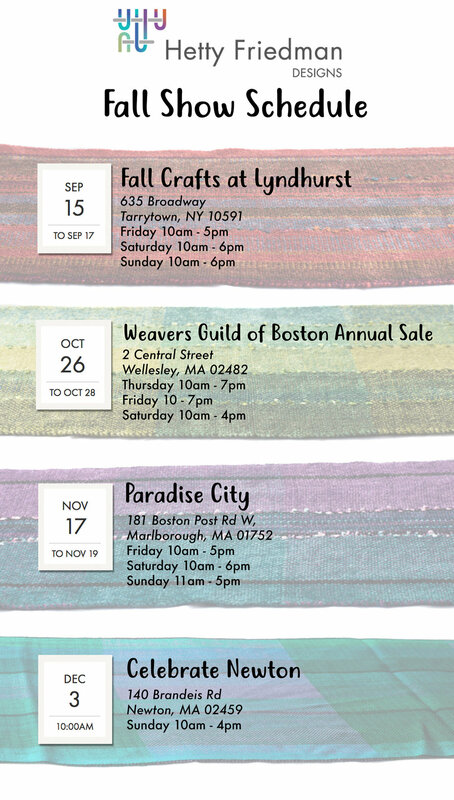 I am thrilled to have gotten into the Paradise City crafts event in Marlboro this year. Join me and a juried selection of 175 master craft makers and fine artists from every corner of America! I’ll have new color combinations for Spring and Summer on hand. It's always great to see a familiar face. Find me at Booth # 201. My new rayon brilliantly dyed scarf collection. Limited # available. Don't forget to print out this coupon for $2 off admission. I’m also offering 10% at this event to everyone who likes my Facebook page! Add color to your life + Spring Show announcements! Even on these very cold (and very white) days, I still try to find ways to add color to my life. How do you like to brighten up your home during the storm? let me know on facebook! Oranges, carrots, beets, lemon, grapefruit, and spinach are all in season this month! 2 - Designing new pieces! I just returned from Guatemala and can’t wait to show you new color combinations at a show this Spring. Over the years, I’ve collected many colorful pieces from traveling, friends, family, and fellow artists. These bowls are from Turkey, the rooster from Guatemala. Who doesn't love fresh flowers? These alstroemeria last forever (or quite a long time. I also love tulips, orchids and hydrangeas. I always save these for inspiration - from artists, galleries, events, and traveling. PUT THESE DATES IN YOUR CALENDAR! Looking forward to seeing you at an event this Spring. Like my Facebook page for 10% off at a show this Spring! Do you get the mid-day slump? I work out of my studio in my home. Does anyone else work from home? This article really spoke to me about some of the challenges - the snacking, the internet, occasionally forgetting to change out of pajamas. Here’s how I like to beat the midday slump! This is my favorite granola recipe that I’ve been using for years. 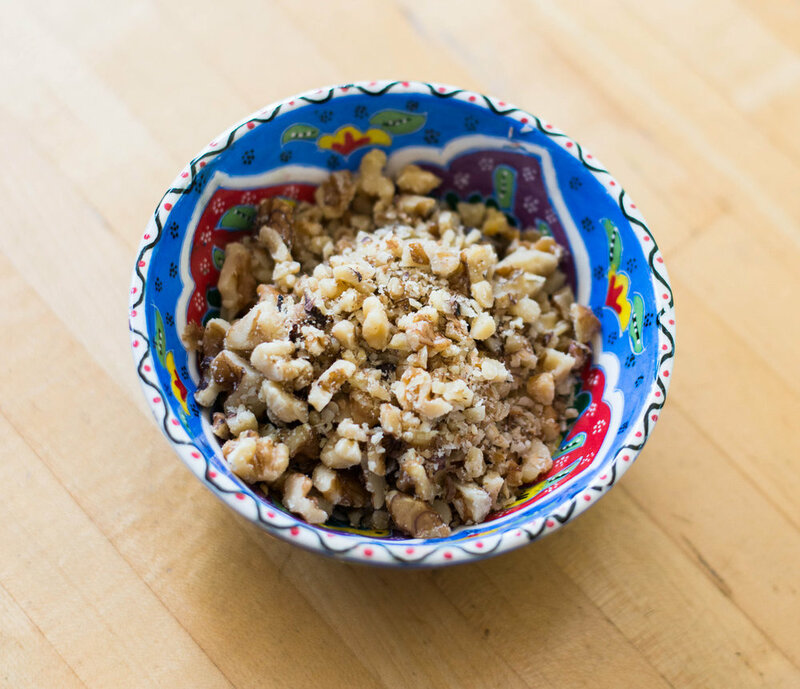 I switch up the ingredients and use different nuts and seeds, like pumpkin seeds and walnuts, and reduce the amount of sweetener and oil to 1/4c each, substituting maple syrup for honey. Bake at 300 F for 45 - 60 minutes, stirring every 15 minutes. Enjoy! I’ve been watching this documentary about the making of the musical Rent - an amazing story of perseverance and trial. We all know how it ends, but the journey is still remarkable. I love to flip through catalogs for color inspiration! Gudrun Sjödén clothes and textiles are stunning - their spring collection, filled with bold, bright prints, can be found here. Bernstein conducting the recording of West Side Story with opera singers - I grew up on this music and it always transports me back to my parents' living room. And of course, #5: taking a nap. Do you work from home? What do you like to do to beat the midday slump? Share your story to my Facebook page. I’m giving away one of these beaded bracelets this month! To be entered into the giveaway, LIKE Hetty Friedman Designs on Facebookand SHARE the giveaway post between today and March 15th. For a second entry, tag a friend in the comments section of the post! I’ll randomly select a winner from everyone who enters. As seen on Etsy. Retail value $35. Where were you the Summer of ’74? In 1974, I spent four months traveling through Mexico and Guatemala. I studied anthropology in college and had been weaving since I was 13 years old. My college mentor suggested this trip to me. It was the trip of a lifetime. I lived with a Mayan family, learned back strap weaving, and collected indigenous textiles. My friend Louise Vogel and I drove all around the Guatemala Highlands and Mexico, studying the textiles. We lived our of her orange VW minivan. In 2006, I went back to Guatemala and began to work with a Fair Trade Weavers’ Co-op. Now, I bring groups of travelers along with me to revel in the beauty of the country, learn about the co-ops that produce my designs, and share about the philanthropy work being done for Mayan Families. I finally reunited with my Mayan family, the Bonita-Perezes, a few years back! We have held each other in our hearts for these last 43 years, and now I am able to see them each time I visit Guatemala. What a love affair it has been for me. Where is your favorite place to travel? Share your story to my Facebook page. Some salves for our souls during these trying times. Here are some salves for our souls, to help, or at least offer some solace during these trying times. You get 15% off AND I will be donating $20 for each of your purchases from my Etsy shop to either the ACLU or the Southern Poverty Law Center until Feb 14. 1. See the glass flowers and gems at the Harvard Museum of Natural History. Had a great visit with Chris and Michaela when she was home for the holidays. Nothing like seeing a millennium of the earth's work to have some faith in the future. 2. See the shoe show at the Peabody Essex Museum until March 12. Who would have thought there could be so much variety? Stop by the gift shop and say hi from me! I always buy something for myself. From a wonderful shirt, to some awesome local chocolate or a cool book. 3. Head over to Passim’s for some home made music. Yes, they are still there and the music’s great! See you this Sunday for brunch? 4. Country Desserts celebrating 20 years on Lexington Street! Go for the chocolate chocolate cupcakes, almond raspberry muffins, and the fruit turnovers. Say hi to Nancy for me. Who says chocolate isn't a breakfast food? 5. Start a new knitting project and get together with your friends to knit and kvetch (or as we do, knit and eat homemade cookies). My favorite local place is Elissa's Creative Warehouse. I’ve known and worked with Elissa for over 25 years (gulp!). Now, to finish my sweater that I've been working on for the past 2(?!!) years. She will help do it all! 6. Take a field trip to NYC! I'm going in February to visit famliy and will see The Tempest at the St. Ann's Warehouse, take a ride on the new 2nd Ave Subway line, and have some wonderful meals. 7. Yoga with Jill Braverman - I take Jill's class regularly, and have to say, I walk out in a totally different space than how I arrive. You can subscribe to her blog, she sends out guided meditations, and other great advice and information. Please share your antidotes to my Facebook page. We all need it now more than ever. I’ve added new chenille scarves in lots of colors to my Etsy shop! They're 15% off with the coupon code FEBRUARYBLUES until February 14th and I will donate $20 for each purchase to the ACLU or the SPLC. Very soft and perfect for cold weather. As always, all Etsy purchases can be sent in a gift bag with a note, anywhere in the country. NEW ON ETSY: THINK SPRING AND GET COLOR HAPPY NOW! 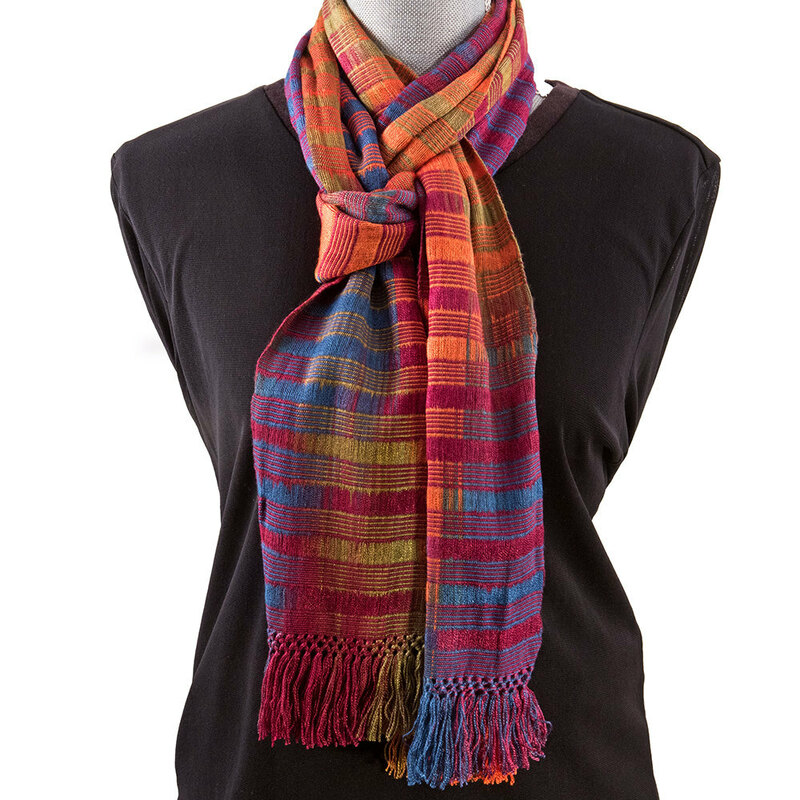 These graphic striped scarves are handwoven in organic bamboo. They're available in six colors - teal, turquoise, purple, lavender, pink, and orange. All Etsy purchases can be sent in gift bags with a note at your request, anywhere in the country! You and I - we accomplished a lot in 2016. Your showing up at my events, supporting the places that sell my work, and joining me on my tours allowed me to pay it forward to the causes that are close to my heart. 1: Mayan Families does an amazing job coordinating student sponsorship and family aid. Silvia Maria, a student from Santiago Atitlan, has been able to continue her education and her family has benefited from donations such as food stuff, a water filter, and household needs. 2: WINGS, GUATEMALA works in the realm of family planning and education. This year’s efforts put a new mobile unit on line and an update of their Antigua clinic. 3: Fair trade weaver’s cooperatives in Sololá, Guatemala and Rabinal, Guatemala have increased their sales through the marketing of my designs, and benefited from technique and design consultations. 4: Womenade Boston continues to support programs that empower teen girls and women in the greater Boston area. If you are local and would like to attend one of our 4 annual meetings, please get in touch. As a member of a giving circle, I have a chance to direct where my money goes. 5: The Second Step fosters the safety, stability, and well-being of survivors of domestic violence. Their annual dinner is inspiring and critical for them to continue on their mission. Join me in 2017! 6: I have donated to a number of local cultural institutions including: MFA, ICA, DeYoung Museum, WBUR, WUMB, WGBH, and Clark University. 7: NRDC (my son’s choice for his Hanukkah giving gift this year)! 8: Southern Poverty Law Center, whose mission is more important every day - fighting hate and supporting victims. My mother, Ida Friedman, felt so strongly about their work that she left them money in her will. 9: Harambee Arts, I have known the founder, Gloria Levine, for all my life. Her work across continents in expressive arts therapy is awe inspiring. Harambee Arts is transforming and improving the lives of women and children who have suffered the devastating effects of trauma caused by violence, illness, poverty, trafficking and other crises. 10: Planned Parenthood - Again, more important now than ever. THANK YOU THANK YOU THANK YOU from the bottom of my heart. Have a Happy and Healthy New Year. More color, more philanthropy, more love and more life.